Dr. 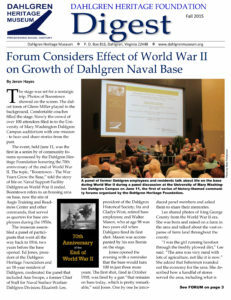 Rob Gates, Vice Chairman of the Dahlgren Heritage Museum Board introduced guests at the Dahlgren Heritage Museum event at the University of Mary Washington on Wednesday, Dec. 12 honoring the gift of $50,000 to the Museum by Dominion Resources. Ed Jones, President of the Board and editor of the Free Lance Star, accepted the check and told those present at the event that some of the gift will be used to get the museum open and in operation. Plans are to open on a limited based during 2013 and use the facility for forums and community events. It is expected that the museum will also become a destination location for travelers because of its location and because the Commonwealth of Virginia will have a tourist kiosk in the building. In attendance at the event were Senator Richard Stuart and Speaker of the House Bill Howell, who helped facilitate the gift. Delegate Margaret Ransone, Dahlgren supervisor Ruby Brabo and James Monroe supervisor John LoBuglio was also in attendance.